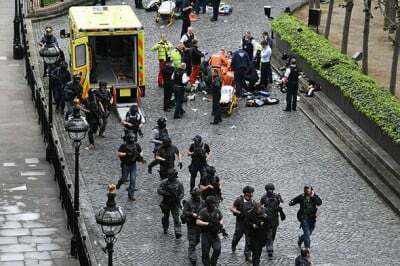 One year to the day after the Brussels terrorist attacks, a terrorist drove a car into Westminster parliament buildings killing four people and wounding several others. The British public are in shock. 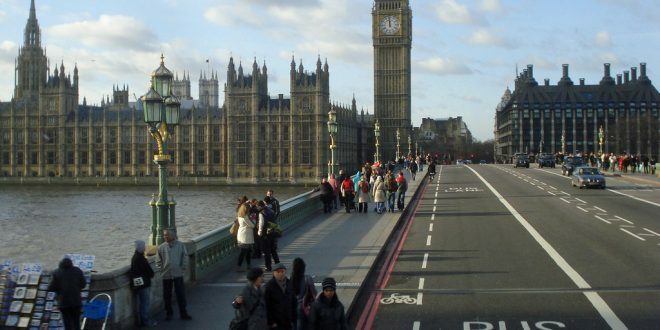 Westminster is considered to be a monument to British ‘democracy’. The date 3/22 will be remembered among those who mourn over the skulls and bones of loved ones lost to terrorism. Today, many of those mourners are in Syria. Just a few hours earlier, 50 destitute families staying at the al Badiya Dakhilya school in the village of Mansoura on the outskirts of Raqqa, were blown to pieces after an air strike by the ‘international coalition’. The Pentagon said it would “investigate” the atrocity. The British Government and its Western partners were silent. Thirty-three people were murdered. The United Nations – the international arm of US imperialism- was mute. The Syrian government asked them why. No answer was given. On the same day, Al Nusra terrorists entered the village of Majdal, Northwest of Hama. Several women and children were reportedly killed. There are not enough reporters in Syria to cover all the atrocities committed almost every day by psychopathic killers the Western media calls ‘moderate rebels’. Westminster was finalising a grand strategy for the Middle East which would combine people-power uprisings and covert snipers, followed by Takfiri terrorism. The US grand strategy for the Middle East was announced by former US Secretary of State Condoleezza Rice in 2005 in her speech before the American Israeli Public Affairs Committee (AIPAC), where she proudly proclaimed that President George W. Bush had a “new policy” for the Middle East and North Africa. The US launched an “unprecedented international venue for reform”, by training activists in social media and regime change tactics. The Centre for Non-Violent Actions and Strategies (CANVAS), Albert Einstein Institute, National Endowment for Democracy, International Republican Institute, Freedom House, Facebook, and many other CIA-affiliated US agencies brought about what came to be known as the “Arab Spring”. The American/Israeli plan for a New Middle East was fully backed by most soi-disant ‘anti-imperialists’, who couldn’t resist the romance and fantasy of revolution and “Marxists” waxed lyrical with “the masses make history”. The attacks on Westminster come at a time when Britain is set to “get tough” on immigration. Though Brexit holds out the possibility of economic and democratic progress in Britain – and immigration needs to be controlled and planned – reactionary forces and news outlets are increasingly pointing the finger at Muslims and Islam as the root of Britain’s problems. A similar process is taking hold in the United States and throughout the European Union. Since the Zionist false flag bombing of the King David Hotel in Jerusalem on the 22nd of July 1946, the Lavon Affair of 1954, the 911 attacks, the Brevik Massacre, and many others, Zionism has boldly carried out terrorist attacks and blamed them on Muslims or far right groups. The war on terror is a Zionist construct which is designed to goad the Western public into supporting foreign wars on behalf of Israeli interests, where recruits from Israel’s Gulf State partners are used as pawns and patsies in the infernal narrative of the “clash of civilisations”.